Treating Hyperkyphosis with Chiropractic Biophysics! Hyperkyphosis, or an exaggerated forward bending posture is a common spinal problem we see at the clinic. Many of us joke about how people today have their “heads buried in their phones” – but over the long term this kind of Hyperkyphotic posture can be of serious concern. This week we look at Hyperkyphosis and how we can treat it here at Complete Chiropractic! Hyperkyphosis is a common spinal deformity characterised by a forward-curved posture of the upper back (the thoracic spine). There are various causes of Hyperkyphosis, but the most common culprit is poor posture. Hyperkyphosis is becoming more common and given that many of us now work in jobs which cause us to sit with that “hunched over”, “head forward” posture this is no surprise! There are many factors which contribute to posture and throughout the day its normal for posture to change especially when doing a variety of activities. 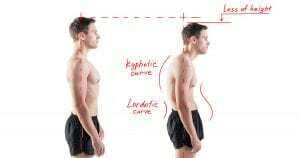 However, when we adopt a poor posture for long periods each day, over time a person’s posture can cause the thoracic curvature to become excessive and stiff, making it difficult to change. Hyperkyphosis can affect people of all ages – and today affects more young people than ever – but the thoracic curvature most often begins to increase in people over 40 and continues with advancing age. It is believed that 20% to 40% of older adults—both men and women—will develop Hyperkyphosis. What are the effects of Hyperkyphosis? Most people recognise that Hyperkyphosis can be a contributory (often the main) factor in back, neck and shoulder pain – and that’s the reason which causes most patients to seek chiropractic care – however research also shows that Hyperkyphosis can lead to compression of the internal organs that lead to reduced lung capacity , reduced rib mobility and spine mobility and even some more serious conditions such as gastric hernia and spinal compression fractures. More alarming, many clinical trials have also verified a link between increased thoracic kyphotic deformity and reduced life expectancy. How can we treat Hyperkyphosis? 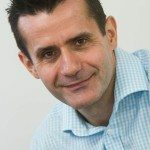 While at recently as 2010 it was unclear if there were any effective treatments for Hyperkyphosis – with many people simply accepting the condition as a symptom of aging. Today however, effective treatments are available! At Complete Chiropractic, we are a Chiropractic Biophysics clinic. Chiropractic Biophysics is an advanced discipline within chiropractic which focuses heavily on long term outcomes based on scientifically provable techniques. Hyperkyphosis is just one condition which has been shown to be effectively treated using chiropractic biophysics methods – including the “mirror image” approach, in which techniques such as chiropractic adjustment, targeted exercises and traction are used to oppose kyphosis and gently guide the spine back to the correct, neutral position. A recent study reported on the results of ten Chiropractic Biophysics patients who were treated for thoracic Hyperkyphosis. In each of the cases, the patients were prescribed thoracic extension methods to oppose the kyphotic posture. In these 10 cases, the results demonstrated an average reduction in Hyperkyphosis of a significant 11.3° over an average of 25 treatments each lasting approximately 20 minutes, over an average of 9 weeks. As you might expect, patients also experienced a reduction in pain levels and disability ratings. At Complete Chiropractic we have state of the art Chiropractic Biophysics equipment available and can provide the latest methodologies in kyphosis treatment. Given that poor posture is such a large part of many of our lives today, preventing Hyperkyphosis from developing can be a difficult objective since many of us can’t simply get away from the desk! Perhaps the best preventative measure is to get regular chiropractic check-ups, and to work to proactively oppose the development of kyphosis. Avoid bending too far from the waist or twisting your trunk too far, make sure you practice good lifting technique! Avoid carrying heavy objects for extended periods of time, or use a support if this is unavoidable. Avoid exercises that involve a lot of bending forward such as toe-touches, sit-ups, or crunches, especially before any resistance exercises. Change how you get in and out of bed. The spine is most vulnerable when you first wake up, so reduce pressure by rolling to your side when you get up. Make changes to your environment to help support your posture, such as using a back cushion and a supportive chair when sitting. Ask your chiropractor about specific workplace adaptations which you could make. Maintain bone health to prevent thinning bones. It is well known that weight-bearing exercises and getting enough calcium and vitamin D are important for strong bones. If you suspect you might be suffering with Hyperkyphosis the best option is to book a consultation at complete chiropractic so that we can properly evaluate your condition and give you a professional diagnosis. Most patients see noticeable improvement within just a few weeks of treatment so don’t delay! Don’t forget to take advantage of our new patient special! Leech JA, Dulberg C, Kellie S, et al. : Relationship of lung function to severity of osteoporosis in women. Am Rev Respir Dis, 1990, 141: 68–71. Culham EG, Jimenez HA, King CE: Thoracic kyphosis, rib mobility, and lung volumes in normal women and women with osteoporosis. Spine, 1994, 19: 1250–1255. Miyakoshi N, Itoi E, Kobayashi M, et al. : Impact of postural deformities and spinal mobility on quality of life in postmenopausal osteoporosis. Osteoporos Int, 2003, 14: 1007–1012. Huang MH, Barrett-Connor E, Greendale GA, et al. : Hyperkyphotic posture and risk of future osteoporotic fractures: the Rancho Bernardo study. J Bone Miner Res, 2006, 21: 419–423. Miller JE, Oakley PA, Levin SB, et al. : Reversing thoracic hyperkyphosis: a case report featuring mirror image ® thoracic extension rehabilitation. J Phys Ther Sci, 2017, 29: 1264–1267. Fortner MO, Oakley PA, Harrison DE: Treating ‘slouchy’ (hyperkyphosis) posture with chiropractic biophysics®: a case report utilizing a multimodal mirror image® rehabilitation program. J Phys Ther Sci, 2017, 29: 1475–1480.